It appears that engineered water systems such as aqueous ozone, which turns ozone into a safe and effective cleaning agent, and related technologies that effectively clean carpets, floors, and surfaces without the use of chemicals have a growing future in the industry. As to when these technologies first found their niche—or at least their market—the big boost was likely in the late 1990s. This is when a series of state and federal regulations were introduced that required manufacturing facilities to minimize or eliminate the use of chemical solvents to clean the products they manufacture and replace the solvents with safer and more environmentally protective cleaning processes. The cleaning solutions traditionally used—acetone, alcohol, and often very powerful chemicals—were found to have an adverse impact on the environment and, in many cases, the safety of factory workers. Reducing or eliminating these cleaning solutions and solvents would help reduce the number and volume of potentially harmful gases being released into the air, reduce the amount of contaminated wastewater produced by these facilities, and enhance worker safety. As a side benefit, this transformation also had the potential of creating a cost savings for the manufacturer. After all, in large-scale manufacturing facilities, solvents and other cleaning agents can be a major expenditure, as they may be needed to help ensure the cleanliness of a manufactured product at every stage of its development. 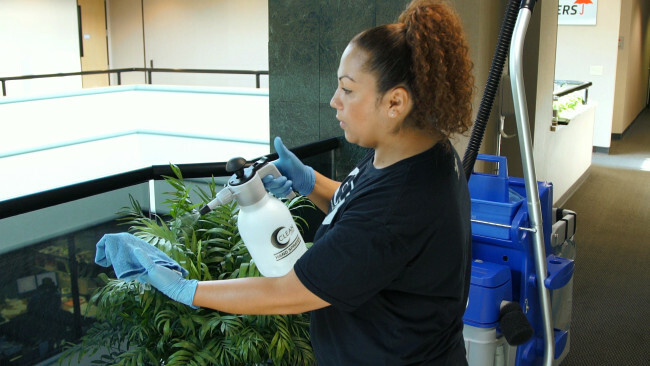 Before turning to engineered water and other chemical-free forms of cleaning, however, manufacturers had to ask themselves a number of questions, many of which facility managers and cleaning professionals have found they must ask today as they look for strategies that help reduce cleaning’s impact on the environment. Does this part (or area or surface in a facility) need to be cleaned? Is cleaning required in all steps of the manufacturing process or just the last steps? How is the part (or area or surface of a facility) getting soiled and what steps can we take to minimize this soiling? The goal here is very simple: Find ways to reduce the need for cleaning and cleaning chemicals. Reducing the need for cleaning and cleaning chemicals is the most effective way to lessen the impact of cleaning on the environment. What these manufacturers in the 1990s realized, and what building managers and the professional cleaning industry are beginning to appreciate now, is that engineered water technologies are available that reduce or eliminate the use of cleaning chemicals. One such technology is ultrasonic cleaning. In ultrasonic cleaning, energy is used to create bubbles in a liquid. These bubbles vibrate, creating a scrubbing action that removes many soils from surfaces. While the systems can vary, ultrasonic cleaning is considered effective on many different parts and surfaces. It is used more often in manufacturing than in professional cleaning; however, ultrasonic cleaning systems are used to clean window blinds and acoustic ceilings and for sterilization. Aqueous ozone cleaning, which uses ozone to turn water into a cleaning agent, is yet another option. Ozone is created naturally in the atmosphere when UV light or electricity (Lightning) interacts with the oxygen molecules in the air (O2). Ozone can also be created mechanically through the interaction of electricity and oxygen. It is then infused into water to create aqueous ozone, which is proving effective at eliminating germs, odors, stains, mold, mildew, and other contaminants. According to Elliott, aqueous ozone is one of the most effective cleaning agents available and has proven to be as much as 10 times as effective at cleaning surfaces as bleach. Several other options are available to those cleaning professionals who wish to clean without the use of chemicals. But the key point is that as these technologies become more affordable and easier to use, their foothold in the cleaning industry will also increase. With their minimal impact on the environment, they appear to be the next step in green cleaning. They are also an example of how industries can adapt to changes and new regulations, and as they do so, find new and effective business strategies that help protect health and the environment.